Dom’s Auto Parts is a third generation family owned business serving the automotive industry for over 50 years. We are located on over 75 acres of property 30 minutes East of Toronto off highway 401. We are pleased to introduce Parts 4 Less U-Pull-It in association with Dom’s Auto Parts. 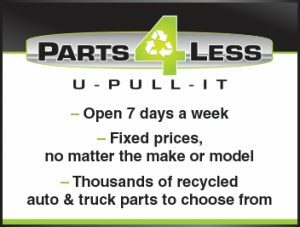 Parts 4 Less U-Pull-It is a self serve u-pull your own parts and save auto recyclers yard. We carry thousands of clean organized and accessible vehicles on 50 acres for all makes and models. We have new vehicles arriving weekly. Conveniently located next to Dom’s Auto Parts at 1598 Baseline Road West in Courtice. 2. Bring your own tools or rent ours. 3.Find what you are looking for in our 50 acre yard. 4.You pull the required part off the vehicle you choose. 5.Pay for the part you pulled at our office. All parts are fixed prices no matter the make or model. Visit Parts 4 Less U-Pull-It for complete price list. All taxes included. Monday – Wednesday: 9:00 a.m. to 5:00 p.m.
Thursday – Friday: 9:00 a.m. to 5:00 p.m. Early entry through Dom’s Auto Parts office available Monday – Friday at 7:30 a.m.
Exchange or In-Store Credit Only. Warranties are only valid to the purchaser of the part and is non-transferable. All claims must be accompanied by the part and the original sales invoice. 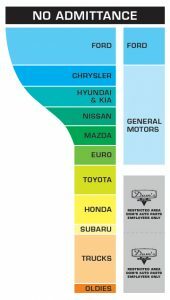 Warranties do not cover loss of time, roadside assistance, lodging, fluids, gaskets or any other related expenses. All claims are paid in Canadian funds. Visit Parts 4 Less U-Pull-It for more information. Copyright © 2018 Dom's Auto Parts Co. Ltd.